Celery Seed essential oil has historically been used for easing and soothing discomfort. My favorite oil blends that contain Celery Seed are GLF and Juva Cleanse. As I receive new tips and testimonials for Celery Seed Oil they will be added to the page, so check back frequently! Want to Purchase Therapeutic Celery Seed Oil? Go to the Oil Shop! 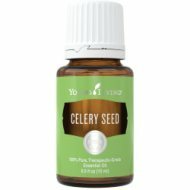 Buy Celery Seed Essential Oil Here! What is the Origin of the Plant Name? Celery comes from Latin word "Selinon" meaning "parsley". Did you know that Aulus Cornelius Celsus a Roman encyclopedist, known for his medical book, De Medicina, recommend the use of Celery Seed in 30 AD? Yes, he would recommend celery seed! What are the Celery Plant Properties? Soothing and relaxing. What are the Documented Uses and Benefits of Celery Seed Essential Oil? May soothe physical discomforts when applied topically. May assist with healthy detox. What is the Aromatic Affect on the Mind? Its spicy, sweet and warm aroma is very calming and relaxing. What is the Spiritual and Emotional Influence? Celery Seed opens and expands the heart chakra and helps the heart and crown chakras align. It releases emotions of anger stemming from hurt, not enough, tired and unworthy. This oil specifically helps to resolve and release fatherhood issues. This includes whether an individual is a father, one has issues with your father or with a fatherly figure; or for women who had to assume the role of a mother and father. The stuck emotions are usually associated with the fact that males are typically taught to assume the role as provider and take on the responsibility and burdens for the family’s needs. Positive emotions that are instilled are tenderness and strength of heart allowing the heart to function correctly and be open. What Chakra is Affected? Root, solar plexus and heart chakra. Interested in Dietary Celery Seed Oil for Your Culinary Adventures? Then check out Celery Seed Vitality Essential Oil! Can this Oil be used for Animals? Yes, but I would use it in a blend. Note on Animals: Certain oils can be very toxic to cats. Citrus and pine oils in particular when using non therapeutic grade oils. Please consult your vet if you are not sure about applying any essential oil to your pet. Celery Seed essential oil is Generally Regarded as Safe (GRAS) by the FDA. Repeated use may create skin irritation or contact sensitization. Did you know that the Celery Seed Nutritional Value is high in Vitamin C, minerals and calcium? Yes, celery seed is one of the best sources of calcium and it is very high in protein!! !